Benjamin Percy, author of forthcoming novel The Wilding, as well as two short story collections, sat down to talk with Sycamore Review’s James Xiao during a visit to Purdue University in March. You can click on the following links to listen to audio clips from the conversation. BENJAMIN PERCY is the author of a novel, The Wilding (forthcoming in Fall 2010), and two books of short stories, Refresh, Refresh and The Language of Elk. His fiction and nonfiction have been read on National Public Radio, performed at Symphony Space, and published by Esquire, Men’s Journal, Paris Review, Chicago Tribune, Glimmer Train, and others. He lives in Ames, Iowa, with his wife and two children and teaches creative writing in the MFA program at Iowa State University. 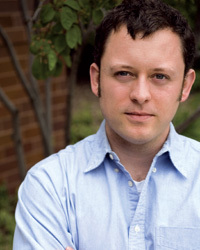 The full transcript of our interview with Benjamin Percy will appear in Issue 22.2, due out this Summer/Fall.